My life is so full of beautiful things. Recovery has been hard and it has been slow but we move forward a little further every day. I’ve told the story, at least what I can remember, time and time again and I feel healing in every retelling. I’ve heard others’ pieces of the story and I feel healing in every tear shed and in every hug and in every prayer. Healing when I hear my husband say how he is grateful. Healing when I spend time with my sister, when we laugh because of little annoyances that mean NOTHING now. Healing when I see my kids, when they laugh and run wild and when the chaos swirls around me. Healing in fellowship with family and friends and Jesus. Healing when I get so tired that all I can do is open up iTunes and close my eyes. Physical healing goes a little slower, but that’s okay. We are ten days out and tomorrow, I would have been thirty one weeks pregnant. Instead, I have a ten day old daughter who amazes me with her strength. I am so grateful and my list is long, long, long. But I want to share one thing today. I have prayed, as you know for this pregnancy and this small daughter since day one. I have prayed for her to be healthy and whole, I have prayed for her to have a sound mind and body, I have prayed for her to be born safely. I have even prayed that she would be a Daddy’s Girl! But in my deepest heart…I have prayed one more thing. Of my first five children, only one had what could be called a “headful” of hair. It was Aubrey and she is almost eighteen now…so it’s been a long time. I have loved my bald and baldish babies passionately…but it was fun having a baby with lots of hair. So, I prayed that silly prayer and I asked the Giver of All Good Gifts if this one last baby could have lots of hair. Now, after everything that happened, obviously I did not care one bit if she had hair or not. It didn’t matter. 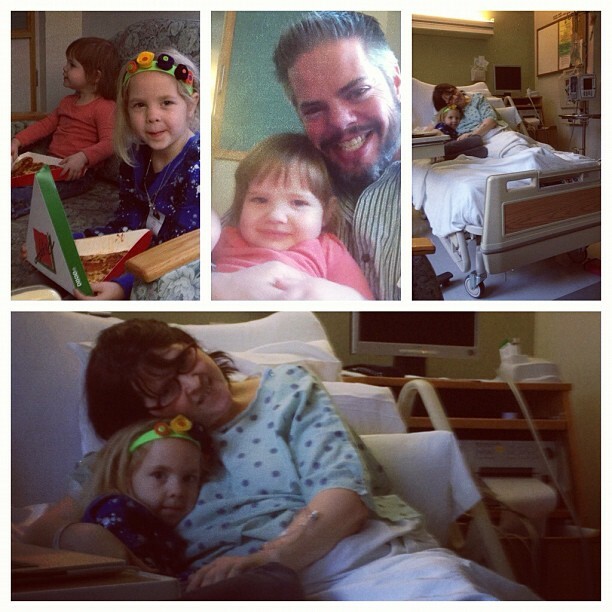 When my eyes finally opened and the sedation haze began to clear on Monday afternoon…I wanted to know about Nora. Was she alive? Was she doing okay? What did the doctors say? I couldn’t speak, I had a tube down my throat and I was on a lot of medication…but with my eyes and by mouthing the word “baby”, John began to understand that I needed to know how our baby was. He showed me this picture and he told me that she was quite well and doing even better than anyone could have expected. Tiny, 2lb. 14oz. But she was okay. And as I tried to hold my eyes open and swim up to the surface, pull myself up through the swampy, sleepy sedation…I held that picture in my heart and I asked to see it again and again. Pictures were all I had those first few days. I wasn’t well enough to go and see her, so pictures are what I relied on. Finally, on day three, I was taken in to meet my sweet, sweet daughter for the very first time. So strange…she’d been in the world for three days and in my womb for 29 weeks, 3 days. But I had never seen her face in person. The first few times I went to see her, I was overcome with love and even tears because she and I had lived through so much together. My heart swelled huge and there was healing in looking down on that sweet face, on kissing her tiny forehead, on stroking her soft hair with one finger…Healing in being together. One visit, she was having her feed and I sat there beside her isolette in my wheelchair, battle worn, bruised and weary. 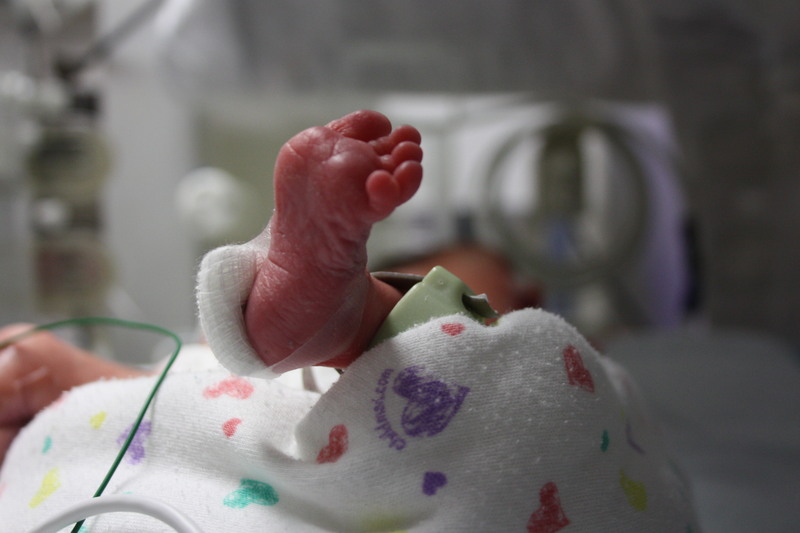 During feeds, preemie babies have to remain still. So, I couldn’t hold her, only gaze at her and that was enough. It’s just what I did. I sat and I just stared at her, at the back of her head that faced my side of the isolette. I thought about God and His Good Gifts and I really saw my tiny little daughter. So, here’s that little head and just know that all that hair is just a little gift to me from God. He brought me through surgery, he saved me when His people cried out on my behalf, He rescued me and He rescued Nora. And then He just gave me this little gift…that only He and I knew I wanted and it might seem silly but it moves my heart. God hears. He knew it would be hard. He knew there would be pain and tears and hard work. He knew that Nora and I were going to be fighting a big fight. He has come through in so many big ways since November 19. He has continued to come through every day since and He can be trusted to stand with us in the weeks to come. 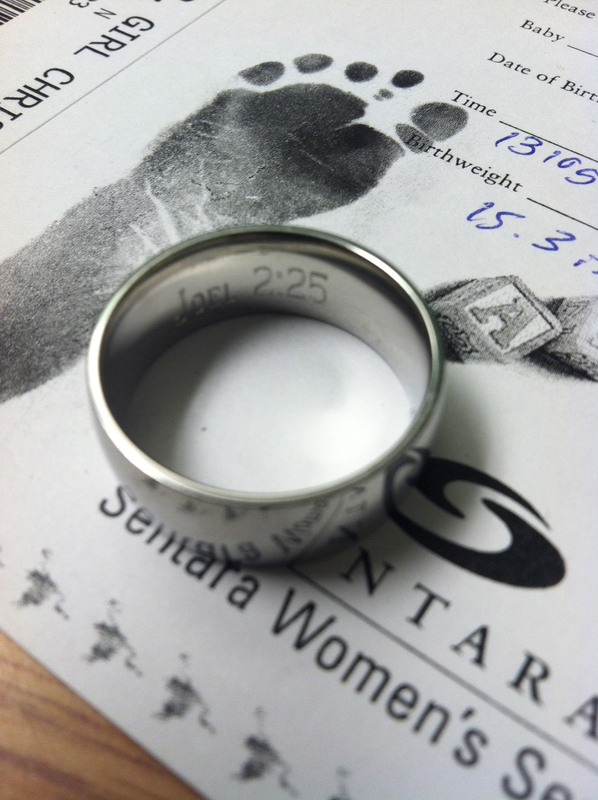 And He gave me this little gift to remind me that He treasures my heart. That He knows my innermost self and loves me bigger than I love Nora. Just a little gift to remind me that He is in the details and His Hands are all in this. My soul sings…because I am beloved of God. And He is good. And those things would’ve been true even if I hadn’t made it through…even if Nora hadn’t made it through. But we did. We are here and God is good. We are here and we are Loved. We are here because Creator God rescued us when His people came together and prayed. Two weeks ago, I woke up and my water broke. Two weeks ago, I didn’t have any idea how much my life was going to change. Two weeks ago, I didn’t know what I was about to face. And over and over again, many times an hour, I say an awestruck thank you to God for hearing the prayers of His people and calling me back from the brink of death. This two weeks has been a crash course in the beauty of the body of Christ and the majesty of God Himself. These two weeks have shown me miracles. Miracles of provision, miracles of service and love towards us, medical miracles and miracles of answered prayer. It started with miracles of provision. As I waited in the hospital for something to change, my sister was organizing and mobilizing the people of God. People I know, people I don’t know, people I can’t wait to get to know have fed my family, cared for my home and yard, taken care of my little girls, purchased needs for our home, Christmas gifts, a recliner for me to recuperate in. God opened up the floodgates of heaven and rained down provision, it just streamed through the hands of His people. We sat in humble amazement as the people of God loved on us. Our hearts swelled. Our cup ran over and over and over. And then I began to hemorrhage again on Sunday after this post and a long visit from my dad and my husband and my kids. It was scary and went from scary to really scary pretty quickly and it stayed really scary. I remember almost nothing from Sunday night at 10pm until 1:00 on Monday. I opened my eyes to a clock that said 1:00 and I could see that it was daytime outside and I knew that just wasn’t right. I’d gone into surgery at 10pm. It should be 1:00am…what had happened in the night? I had one flash of memory- tons of voices talking, pain in my mid section, feeling paralyzed and terribly afraid but that was my only memory. And it was brief. I lay there, intubated, trying to figure out what had happened. When I finally got the tube out (shudder…that was rough)…John and Bethany filled in the gaps for me. I was prayed away from the brink of death, friends. John said it did not start to turn around until he and the rest of my family began calling on people to pray and pray with authority. I had been losing blood faster than they could replace it. I was up to 24 units- the body holds 8. I had a procedure done in radiology that was a last ditch-this might work procedure that did begin to work. As the people prayed, my bleeding slowed. As the people prayed, I began to come back. I listened to John and Bethany talk about how close I’d come to leaving this world and was humbled anew. Miracles of medicine and medical know how. That my doctors never gave up. Miracles of a praying people. Miracles of a praying people who spoke, sang and shouted life over me. And as all of that went on and the battle for me was raging…a little girl noisily entered the world and defied all expectations. Nora Elizabeth Jean, world changer did well from the moment she was born screaming and flailing. 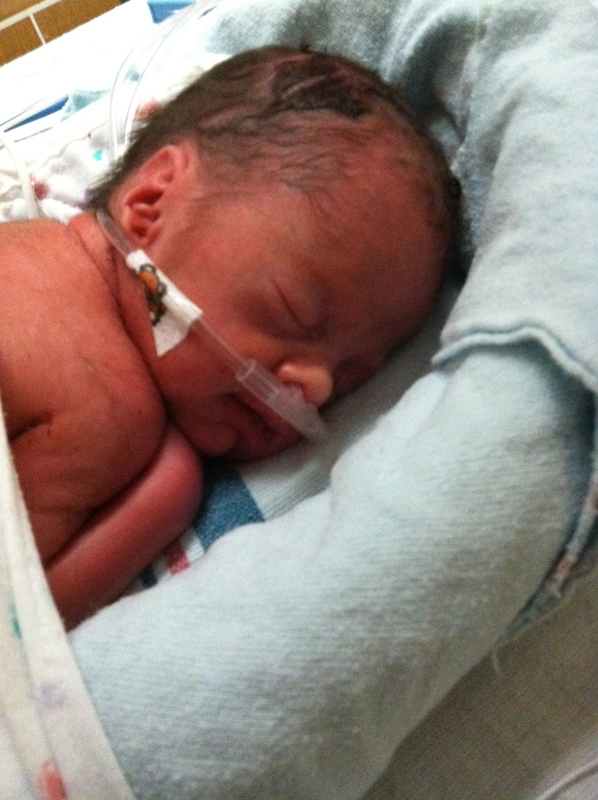 This tiny two pound, 14 ounce long miracle girl burst into the world and amazed us all. She has done so well since the very beginning. And now she is six days old and she has a long road ahead of her but I can see her strength and I know that she will continue to grow and grow stronger. At first, after my surgery and my experiences, I was really unwell. I would fall asleep in mid sentence, I had pain, I was exhausted. 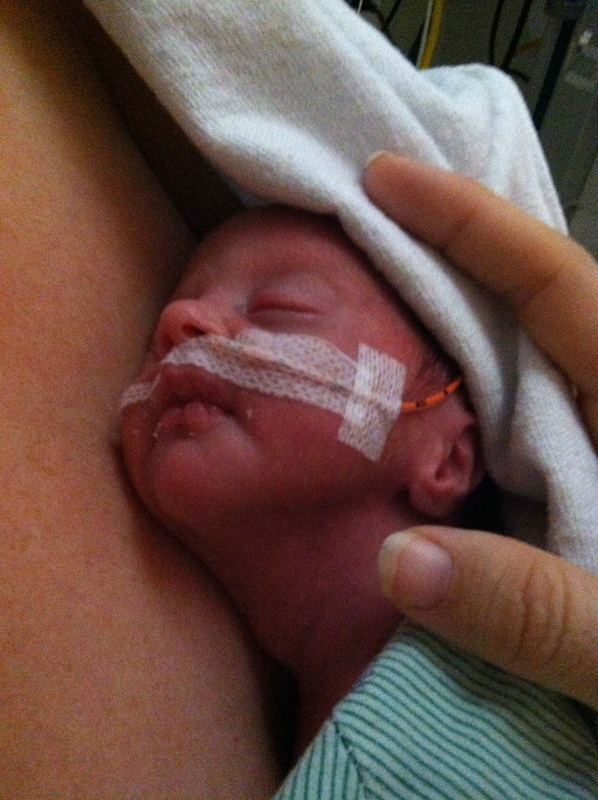 It took until day three to have the stamina and the strength to come and meet my sweet little warrior princess. But that day came and I was deeply amazed by her. For one thing, she is indescribably tiny. For another, she is fearfully and wonderfully made. For a third…she is my prize for surviving all of this and I love her big. It’s as though all the strength of all the women she is named after (and there are about 20 people she is named for with Elizabeth and Jean) have come together in Nora. She is strong, feisty, tough…a fighter. Her daddy and I are so grateful for her big presence and her tiny, well formed body. She has a purpose and a destiny and she is beginning life with an amazing testimony. 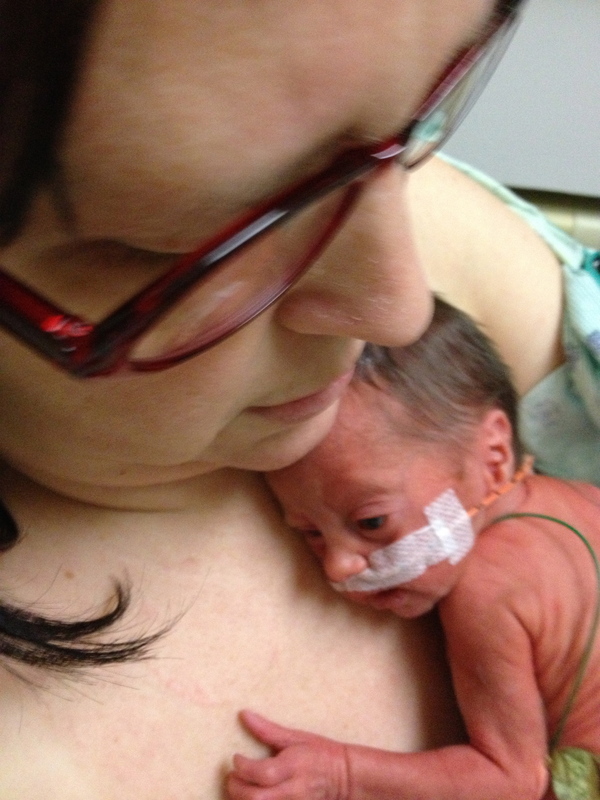 The second time I went to see her, I still felt such awe…but also overwhelming love and gratefulness and I wept as I held her for a good ten minutes. Tears just fell as I held her warm little body close. Thank you, Jesus for saving us. For letting me hold this precious daughter. For letting us have each other. Our lives have changed in two weeks. We are humbled and loved deeply. We are thankful and our hearts overflow. We are aware of the power of God’s people, of the power in His Hand. Two weeks ago, my water broke…today, I’m going home. I’m recovering. I’m going to be okay. We have the day Nora comes home to look ahead to. We have days in between where we can just sing praises and shout our thanksgiving and love each other. 1 The LORD is my shepherd, I shall not be in want. 2 He makes me lie down in green pastures, he leads me beside quiet waters, 3 he restores my soul. He guides me in paths of righteousnessfor his name’s sake. 4 Even though I walk through the valley of the shadow of death, I will fear no evil, for you are with me; your rod and your staff, they comfort me. 5 You prepare a table before me in the presence of my enemies. You anoint my head with oil; my cup overflows. 6 Surely goodness and love will follow me all the days of my life, and I will dwell in the house of the LORD forever. For eight days, this has been my home. I’ve left this room one time only and that was to have an MRI, which was not a fun experience but is a funny story. At least, it seems funny now. I’ll tell it to you if you come and see me. I haven’t been outside in eight days. I have woken up and gone to sleep here, in my cozy hospital room and some days I’ve been lonely and scared and weepy and some days I’ve been resilient and brave and ready to take on the world. Some days I’ve been both. And the thing is? This is just the beginning of the journey. We are now aiming for between 32 and 34 weeks for delivery. So, the soonest Nora will have her birthday is December 6 and the latest she will have her birthday is December 20. And after that, I’ll be recovering from the c-section, the hysterectomy and maybe a little bladder surgery. And after that day, I’ll have a preemie baby who will need different things from me than a full term baby would have. This past week…just the beginning. And I’m not discouraged, I just kind of woke up tired today. It’s Sunday, my favorite day and I’m thinking about how I would usually be headed to Kid Kraze right now to serve the children…thinking about how I miss them and miss the energy and the excitement and their wide eyes as they learn about Jesus. On Sunday, we hang out together at my parents’ or at home or out and about and I miss them. I miss my family. In the evening, we all go to church together, have dinner around the table and have our Bible study. They will still do that evening stuff…and I’m so glad they will…but I miss them. This morning, John is bringing the whole crew up here to see me and I’m really, really grateful. I’m used to noise- kids arguing, kids laughing, things spilling, dog barking, someone running up and down the stairs, conversations and discussions and singing, puns and jokes and people trying on different dialects…it all mixes up and turns into the glorious chaos that’s like a blanket wrapped around me. Here, it is noisy but it’s different. The noise is outside of my room and parts of the day I pass by myself, tv on quiet or music playing quiet while I read or crochet or…read or crochet. Things are happening here but it’s not my chaos. Not the chaos I am used to. But it is where God has me right now. And so, I will hang in there. I will take it one day at a time and let the joy of the Lord be my strength. I will rely on the mercies that are new every morning. I will stop to be grateful for every little milestone met, every kind word and every favor done for us. He is good. He is with me. I am so grateful for visitors. I am grateful for reaching 29 weeks. I am grateful for all these pretty fall flowers that I’ve been given. I am thankful for Zia’s birthday…because I just love her! Here are some things I have learned in the past five days. 1. You can’t be a control freak in the hospital. When in the hospital, you are literally in charge of nothing. People wake you up in the middle of the night just to take your temperature, you’re at the mercy of others for when you can shower, eat, change the bedclothes. A doctor just stopped by to tell me that a whole team of doctors knows all about me and are all putting their heads together to figure out the best courses of action for Nora and me. Strangers who know more about my uterus than I do. I’m doing okay with this, but…it is sometimes a little bit difficult. 2. Placenta previa doesn’t actually “move”. Your uterus grows and takes the placenta previa to the right place. Or something. So, in my case, it looked like it “moved” quite a lot, but it didn’t move completely. Which leads me to my new vocabulary word. 3. “Accreta: The abnormal adherence of the chorion of the placenta to the myometrium of the uterus. Normally there is tissue intervening between the chorionic villi and the myometrium, but in ‘placenta accreta, the vascular processes of the chorion grow directly in the myometrium. Placenta accreta can progress into placenta percreta.” I have this problem. And, it is growing into not just my uterus but also my bladder. This will make the day of my surgery tricky. They’re going to take the baby out, then assess if they need to do a hysterectomy (which they are 95% sure they will) and then assess if they need to do bladder reparation. I never knew this word before, in twenty years of baby having…and now it is a major part of the equation. 4. Hospitals are loud and do not run on time, in general. Something that “always” happens at 7:30 might happen at 9:30 tomorrow. 5. Nurses are amazing people. They are the “mothers” of the whole floor. They nurture, they care, they are invested. They listen to me talk about my family. They pore over the pictures that are all around and they act like they don’t mind cleaning up gross things. They are compassionate when giving shots, taking blood, waking me up in the middle of the night. The nurses here have made me feel…in a weird way…secure and welcome. They make it easier. Today I am 29 weeks and that feels like a milestone. One of the doctors yesterday reminded me that every day is a victory. I’m reading a book about preemies which I can only stomach about one chapter at a time. I have a ton of peace about Nora and about how she’ll do, but I know she’s beginning her life differently than most little babies. And I know that her first experiences in life won’t be snuggling and nursing and crying…but learning to breathe, working to stay warm…she’s beginning with Hard Things and it’s going to be different. She will spend Christmas here, almost certainly. I’m nervous about the moment when she leaves the womb and faces the world. 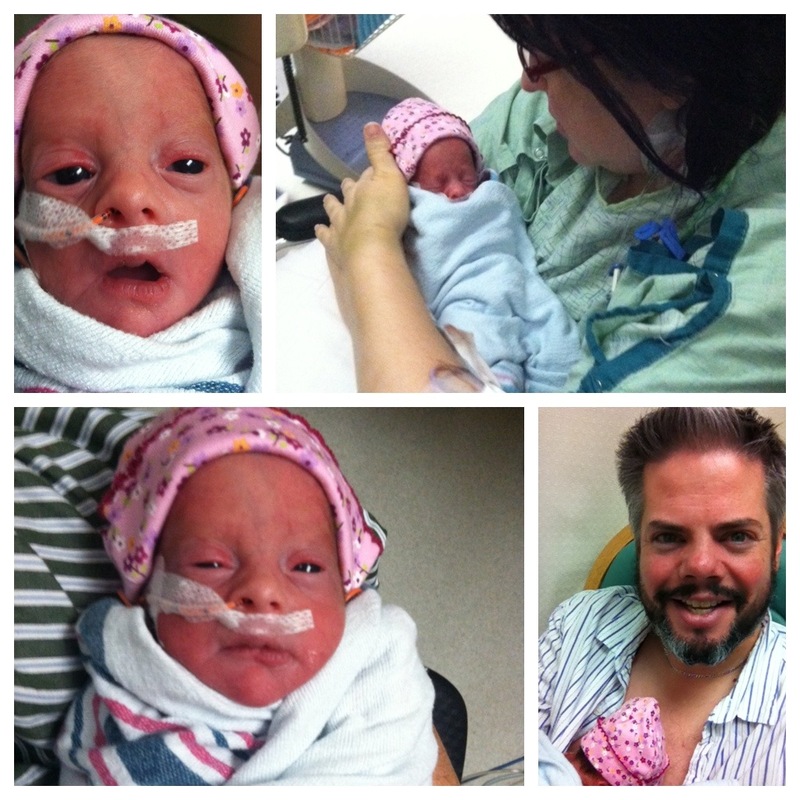 She is already our precious and cherished daughter…and we so want her to be well. I’m nervous about the surgery itself. I had a hard time with my previous section, being open for a whole hysterectomy and a bladder surgery following the birth make me quite nervous. It’s all going to be figuring it out as we go along and so there is no reality except that it’s going to be stressful and it must be endured. I keep telling the O.B.’s that the anesthesioligist needs to be prepared to knock me out if I start to lose it. In general, we’re all holding up well. I love having visitors and it helps with the tedium, the loneliness, the homesickness. It helps SO much. It also helps to know that everyone is home is being well cared for. People have poured out so much love on us. So, if you want to come and see me, let me know. I try and plan out my visitors so that I wind up with people every day. I’d love to see you! Keep praying for us. God is always faithful and His steadfast presence is really getting us through all of this. We went from a good appointment on Friday to my water breaking on Saturday which is basically how this pregnancy has gone from the beginning. I woke up Saturday morning with the feeling that something was just not quite right and I’ll spare you the details. I ended up heading in to Mary Immaculate to find out if my water had broken, which indeed it had. I was there a few hours, then sent to Norfolk Sentara by ambulance. Yes, ambulance. With a siren. The first day and night here was a little rough. I had a very uncomfortable catheter and the labor and delivery rooms are not super comfy. They’re not made for camping out, but for laboring. 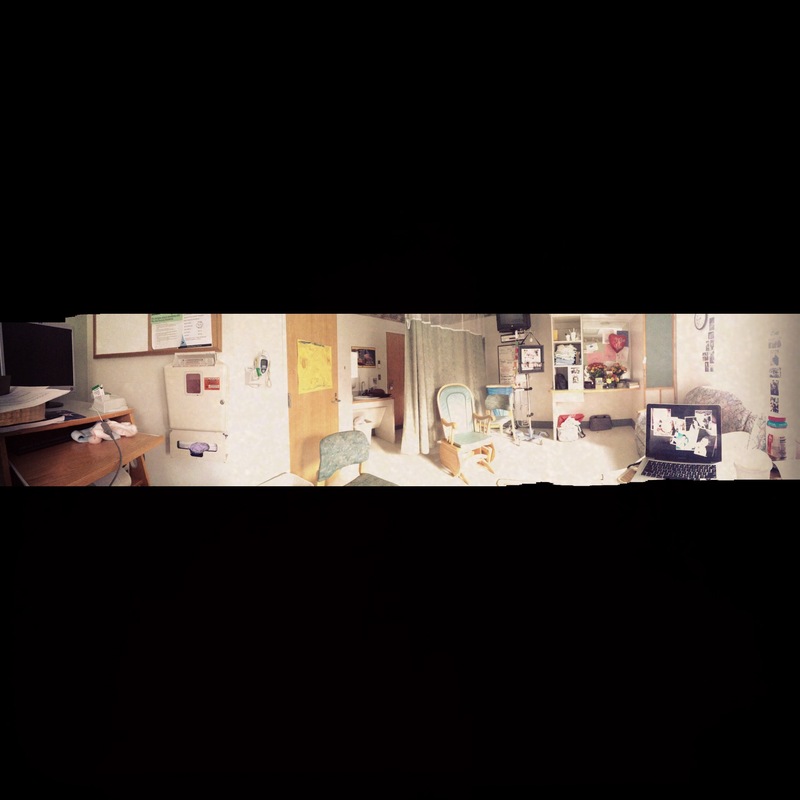 It began to seem clear that I wasn’t about to go into labor at any moment so they’ve moved me to the antepartum wing. Those of us that are here are trying to stay pregnant. Women with preterm labor, preeclampsia, ruptured membranes, etc. It’s more quiet, more comfortable. I’m on day 4 and while I’m really, really bored I’m also really grateful that Nora continues to do well and shows no signs of evicting herself any time soon. The big goal is to make 34 weeks, which is on December 20th. Right now, today, I am 28 weeks, 5 days. It’s surreal, actually. That I’m here, that I’m not home, that the life of my family is just trucking on without me. I am eternally and humbly grateful for the kindness of all who are pitching in to help. Stories of food, groceries, gas cards, babysitting, prayers, visits, love, Christmas shopping, and everything else you can think of have blessed my socks off. We are so blessed to have such an amazing support system of family and friends and those people have some amazing people in their lives too because people I don’t even know are helping my family. I’m taking it one day at a time and just staying focused on helping Nora thrive. I miss everyone so, so much but she needs my undivided attention right now and her need is greatest. I am praying for her, lying still for her and sort of just hibernating here in Norfolk for her. I’m hoping we make it to 34 weeks but count each day that passes as a victory. Every day brings her closer to health. Now, I must get back on my gratitude track! I’m still grateful, even if my plans have been a bit disrupted! I’m really thankful that I got to see Aubrey be in two plays lately. She’s so good and it’s so fun to watch her do something she loves! 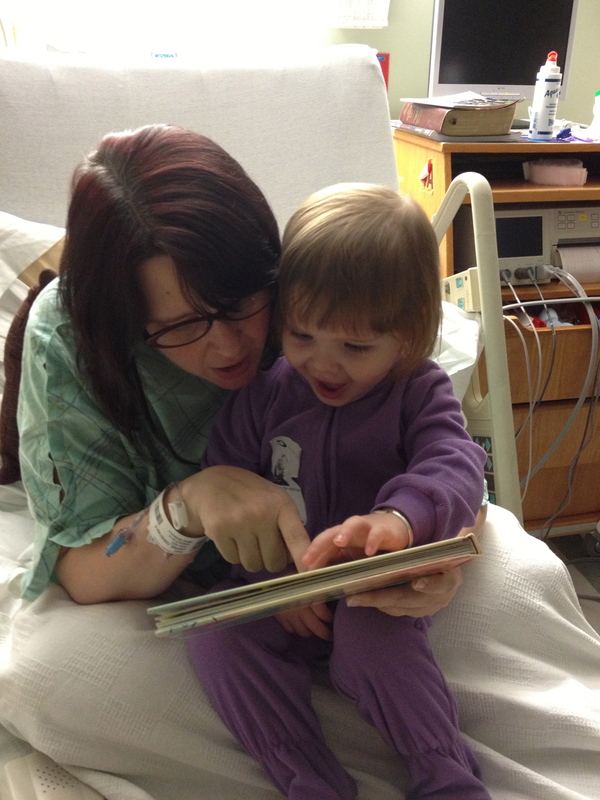 Thankful for medical breakthroughs that help babies like Nora. I’m so thankful for the steroid shots for her lungs, for the antibiotics that are keeping us infection free, for this hospital and the doctors, nurses and students here. I already have my favorites. Thankful that my children are being well cared for at home by their sisters, their Nonnie and their Nana. It makes me feel happy and at peace that home is going on as it should be and they are not displaced. I sure do miss all five of them (and my nieces and nephew too!) but I’m glad they are doing just fine. I’m thankful for the kindness of our community, for the generosity of our church family and our friends. I am thankful for my sister’s organization skills as she has basically mobilized the city of Grafton and other parts of the peninsula on our behalf. It’s humbling. I know I keep saying that but it is. To be helped so much is just beautiful. I am so thankful for the way God really does work everything out for God. He has brought provision and good through all of this and I know His hand in on Nora. I know He is growing her and preparing her for life. I am so grateful for His peace in the midst of this…for His mercies new every morning. We are holding out for December 20th, which would have me home by Christmas, even though Nora would have to stay behind a bit longer. Luckily, she won’t remember Christmas this year and by next year, she’ll be into everything and we’ll be reminiscing about 2012! Yesterday ended up being a hard day that was capped off by another sleepless night. But I figured I’d better take my own advice and practice gratitude even in the midst of a hard day and a sleepless night. God came through with miracles yesterday. Divine provision that I know He orchestrated. I am thankful. And this morning came the gift of perspective when I received an email from Peter at the Good Samaritan Orphanage in India. His email was a plea for help, asking me to pass on information about them to my pastor, to other friends, to anyone that might want to help. 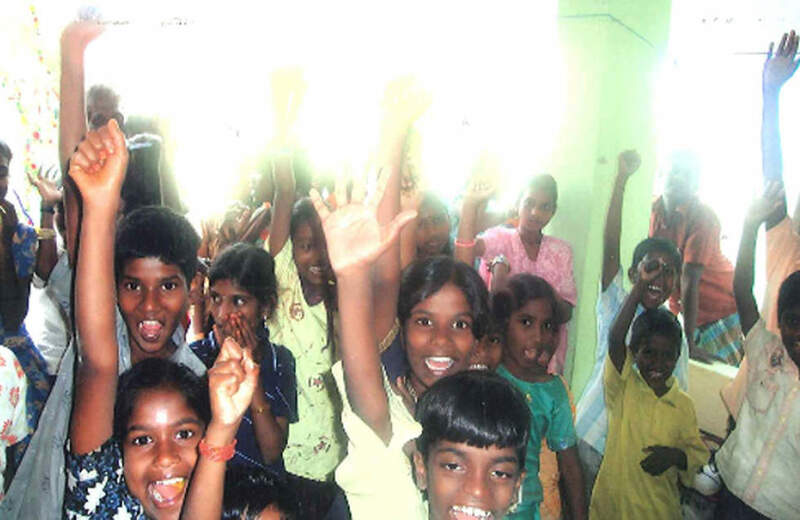 There are 54 children and only 20 have sponsors. There are 19 ladies and only 6 have sponsors. 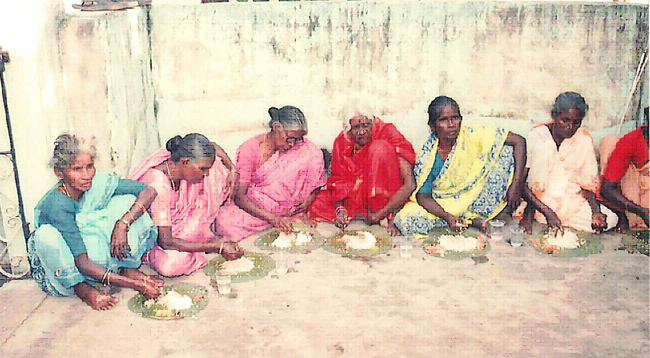 Without sponsorships, it is very difficult to feed and clothe everyone. It is very difficult to educate the children and provide medications for the elderly ladies. I am thankful for Peter and the Good Samaritan orphanage. I am thankful that Peter, day after day, is willing to serve the widows and orphans that are so close to God’s heart. Even though it is a trial and even though he and his family must live in virtual poverty to do it, he is there for them every day. He is ever believing that God will bring enough sponsors, enough one time donors, enough support for them to get through every month. I am thankful for the Good Samaritan group, because they have taught me to take my eyes off of myself. They have taught me to pray for miracles and expect them to happen. They have taught me that God will never let the faithful be put to shame. They have shown me perspective. If you want to help Peter’s orphans and widows, either monthly or one time, please contact me and I will help you get started. Or, simply click here to give online. Next to “amount”, be sure and click the drop down menu and choose “India Mission”. If you’ve decided to sponsor, please let me know. I would love to be able to find the 34 sponsors needed for the children and the 16 sponsors needed for the ladies! Today is November 7 and the election is over and I’m not going to talk about that here except to say that when I woke up this morning, God was still God and He had not changed. I’m going to carry on with my month of Thanksgiving. I’ve loved writing since I could put words together on a piece of notebook paper. I can remember trying to craft stories as a very little girl with my picture dictionary. I can remember filling notebooks with stories of teen angst when I myself was an angsty teen. I’ve been blogging for at least eleven years, working on fiction books and Christian life books that never really get finished. I love to write. I love to watch the words flow from my fingers, love the sound of the keys as I type…I love the process and I love what happens in me. Writing helps me see where I’m really at with things. And how I love to read. 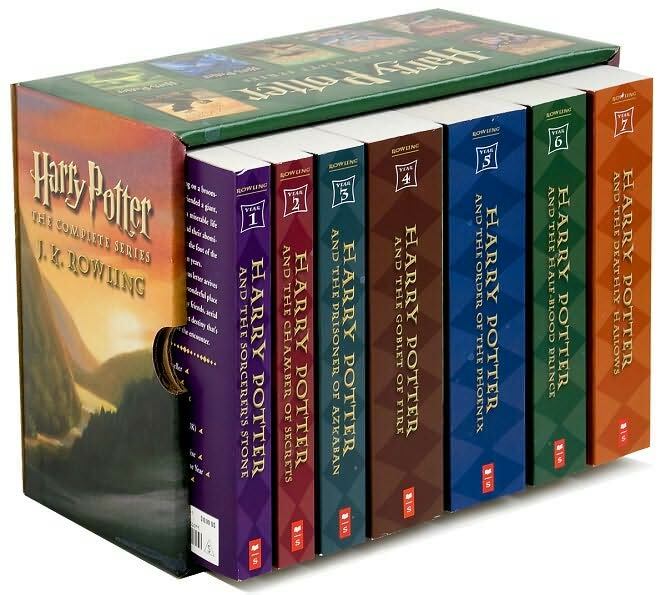 My sister once said that I’d read the back of the cereal box or the instructions to the microwave if I was out of books. She’s right. I love the written word. Imagine my happiness the first time I went to John’s house and saw his wall of books. 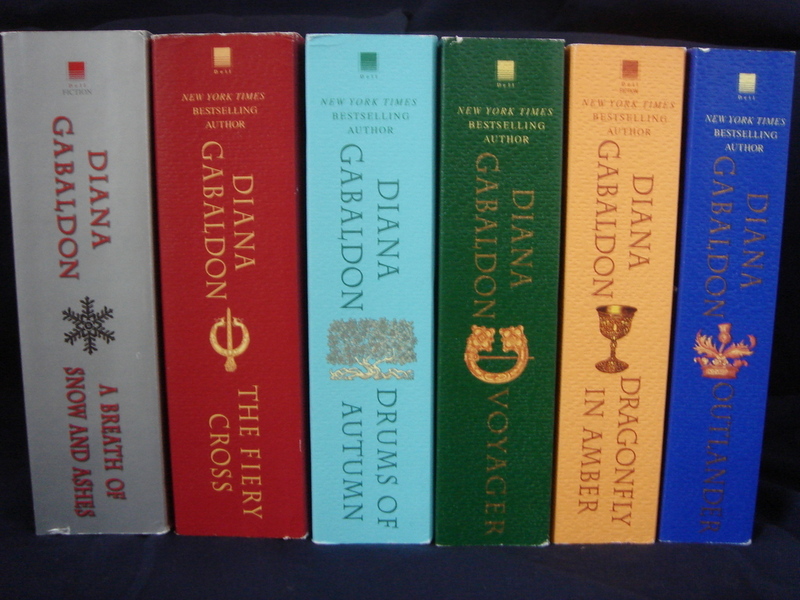 I’ve married a man who owns at least 1000 books! Here are a few of my favorites. 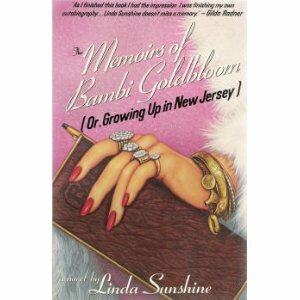 Funniest Book I ever read- I read this book so many times that cover fell off. I still have it and I read it for the first time at like 15. I could go on and on with books I’ve read and loved. Spoken words are very important to me as well. I believe there is such power in the things that we say to each other. My love language is words of affirmation (unless you’re John, then it’s Acts of Service) and a sentence can send me into self doubt and confusion or it can make my whole day. There are things people have said to me that I’ve remembered for years. There are things I’ve said that I wish I could take back. Words, words, words. They can be a gift or like tiny daggers. Are you doing November Thanks? Do you feel like it’s too late to start, now that it’s November 7th? It’s not! You can start right here and right now. You can make a little list from 1-7 and share your joys with the Joel2Twentyfive community. You can write them in your journal, put them on facebook or tell them to your family over dinner. It’s not too late. Begin the practice of gratitude! Today is November 6th and yes, I’m thankful for democracy and thankful for the right to vote but what is really on my heart right now is how thankful I am for the input of the churches and church families I’ve been involved in since I was a little girl. 1. This is the church I have the earliest memories of, though I know we attended others at this time too. New Covenant Church. Paw’s church. A church where there was dancing in the aisles and tambourines ringing. Where the sound of everyone opening their Bibles sounded like rain. Stained glass windows filling the sanctuary with a glow and a gigantic pipe organ…I used to count the pipes as I leaned against Paw. I learned there that worship is for everyone, even the little children and that worship is precious to God’s heart. That He inhabits the praises of His people. 2. As a tween, we went to Seaford Baptist. I was an awkward, quiet teenager who didn’t get involved in much. But I remember being allowed to serve in the nursery for the first time. And it is there that I discovered that I loved that kind of work. Flannel graph stories and little songs for little ones. 3. In my teen years, it was York Christian Fellowship and I had so much spiritual growth here. I sang on Sundays, worked with the kids sometimes and I knew everyone and everyone knew me. People invested in me and loved on me and I learned the importance of really knowing and being known. 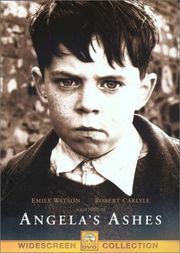 This did not stop me from a period of rebellion in my late teens, but I think it set the stage for my prodigal return. 4. The Vineyard. I went here as a young mother and it was the first church I’d chosen for myself. I learned here that I loved the body of Christ, I loved the Church and wanted desperately to be a part of it. 5. Zion Methodist. I loved my time here. I was a youth group leader and it was a job that I loved dearly. It was wonderful to go to a church in the community I lived in. I loved serving with people I saw in the grocery store or lived down the street from. I love singing in the choir. Zion gave me confidence in what I had to offer. 6. Where do I even begin? Hope Community Church. Where I was changed, refined and where my relationship with Jesus became real and tangible. I learned about my broken places at Hope and I learned how to let Jesus heal them. I learned about my flaws and how to become better. I was loved well by community and I had a place in it. I was able to serve within my giftings and when it was a stretch and that helped me know myself better. Twelve years and I wouldn’t be who I am without those twelve years and without that place and those people. 7. And now WEC. You’ll often hear our pastor say, “We’re going to change the way the peninsula feels about church.” but being a part of WEC has changed the way I feel about church. I’m no longer a consumer, out to find the perfect church that meets my needs. No, I want to be on the front lines, meeting the needs of God’s beloved ones. I am thankful for these places. 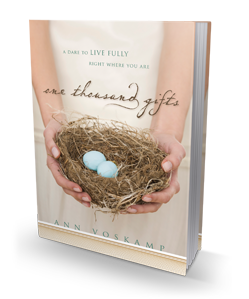 For the worship choruses, Scripture songs, hymns and free worship. For the out loud prayers of impassioned believers to the quiet prayers of the reserved. For the kindness of every single person I’ve ever done ministry with.For every Pastor, elder, ministry leader and for every student, child, teen and adult that I’ve come into contact with…I am thankful for all that I have learned. I think it’s so incredible how God uses people, places and even things to weave us into who we are today. Thank you Lord for the local church, for using it to minister to people. For using it to draw people closer to You. 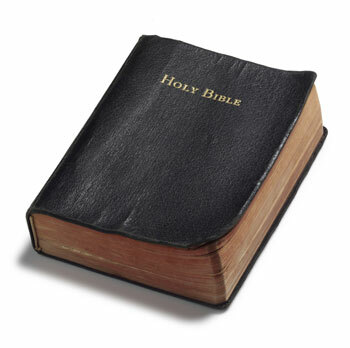 For using it to change our hearts and heal our wounds. It is beautiful. So here are three more. I am rich in family. Not just John and the kids, but my extended family and his. My parents, my sister and brother in law, my nieces and nephew. My cousins, my aunts and uncles. The grandparents I was able to know and the ones I wasn’t. My special Paw whose loss I still feel. John’s family, people I would choose to know if they weren’t related to us. They are like the dream in laws. We are rich in family. 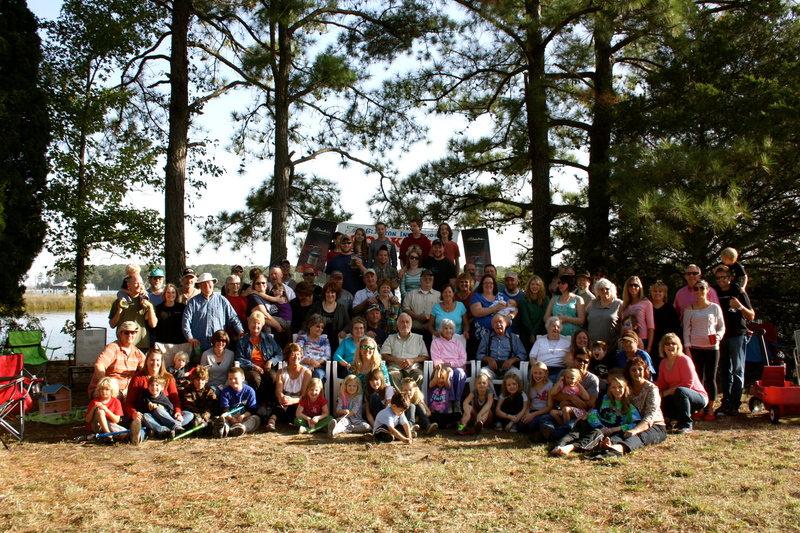 Here’s a picture of just one part of my family. 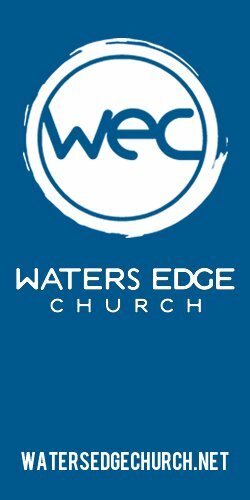 I’m grateful for my church, Waters Edge Church. It’s the place we landed after leaving the church my children and I had gone to since Chase was not quite two. I will always be grateful, grateful, grateful for my years at Hope Community Church and I could write a 2000 word post about all that place was to me and how much I loved it. I left with nothing but love for Hope…it was just time. But November 4 is for Waters Edge and I’ll tell you why. 1. Waters Edge is committed to excellence. There are the components and only three- Sunday worship, community groups and volunteering. Each component is done well and thoroughly and each one is a pleasure to participate in. I love the worship service, I love my community group and I love volunteering. I do my service in the children’s ministry. My little girls love their classes and that makes me happy. All of us, except Chase serve in in Kid Kraze or Wee World. (Chase is a greeter.) It’s wonderful to go, plug in, serve the Lord out of our giftings and then go to another service time for worship. 2. Waters Edge wants to change the way the peninsula views church. I love this concept. Jesus said he came to seek and save the lost. We are commanded to love one another. Waters Edge is fixed on these two things. Salvation and love. What more is there? What could be more important? When I hear the stories of salvation, when I see the baptisms, when I watch the church grow…I am reminded that you will know a tree by its fruit. I’m happy to be a part of it. Just yesterday, Waters Edge’s third campus was opened and 1100 people attended. I think that’s amazing. This one may seem crazy at first but bear with me. I am infinitely grateful for hard times. I know, I know, what person in their right mind would be glad to endure hard things…but I am. Because every time I go through the Big Life Stuff and every time my table collapses and I have to rebuild….God and I hash things out. And every time, I come away changed. I come away refined. And yes, I’d rather it be rainbows and sunshine all the time…but that’s not the reality of life. I am so glad that God is faithful to use these hard things to purify me and to make me better. He really does work all things together for our good. I’ve learned a lot about me and even more about Him as I’ve navigated tough waters. I’m grateful for that, because I want to be better. I want to do better, I want to be a better witness for Him.